Quick intro if you don’t mind. I’m away for a short holiday this coming Friday….heading over to Toronto for 10 nights to meet up with old friends. I’ll be taking in a bit of baseball as the Blue Jays edge closer to a first divisional title since the heady days of grunge as well as some golf and hopefully maybe even a bit of live music if I get the time. I’m having to plan the next few weeks worth of postings so what is going to happen this week is that the four Imaginary Albums I have in the can will appear back to back; this coming Saturday will see the ‘new’ feature kick off in my absence and then there will be a period of random stuff back-to-back including the return of SWC and the numbers pick. Apologies in advance if anyone sends over e-mails that aren’t acknowledged….I will get round to everything back to normal in due course. In the meantime, here’s a delightful contribution from Walter over in Germany whose own blog A Few Good Times In My Life provides much enjoyment. As spoken a few days ago and inspired by your fantastic series I made me up to compile 10 songs by Billy Bragg. Knowing that is a hard task as well I selected these songs first because they accompanied during the last decades and second because they show the facets of his musical output. On one side he made a lot of songs with a political background reflecting what’s going on in these days. On the other side he is one of the last poets making very personal songs about his life, love and family. So it’s nearby that this compilation is divided in a political and a personal side. This song appeared in 1996 on ‘William Bloke’ and not played very often. For me it’s a perfect description of a town and the people somewhere in England. And at the end you’re surprised that it’s Belfast – not far away as politics might think. This is Billy’s version of a song by Leon Rosselson about a 17th century group known as the Diggers in Surrey. They simply wanted a share of the land. Unfortunately, Oliver Cromwell didn’t share their ideas and used the army to put down the Diggers, as he wanted to protect the ruling elites’ position within society. Woody Guthrie wrote this song in 1948 when he read about an airplane crash in Los Gatos. The crash resulted in the dead of 32 people, 4 Americans and 28 migrant farm workers who were being deported from California back to Mexico. It is a song that was very close to ‘Grapes of Wrath’ and is a standard interpreted by Billy Bragg on ‘Talking With the Taxman about Poetry`. This is his song where he protests against the British monarchy and it’s time for something different/new. Maybe this is the song that made him famous. What I find really poignant about this song is how cold and brutally honest he is. “I don’t feel bad about letting you go I just feel sad about letting you know” – he knows it’s going to be painful but he feels no guilt. And also the “I’m just looking for another girl”. Imagine saying that to someone when you broke up! Another song about an engagement that couldn’t last longer. 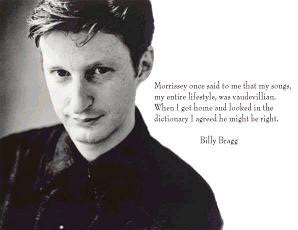 There are seldom songs that express so much what happened between two people like the ones by Billy Bragg. The Tank Park is the Bovington Tank Museum near Wareham in Dorset, UK, and I believe the title of the song refers to a visit Billy and his dad made there. It is a moving song, especially if you have lost your dad, and moves me to tears, But of course, Mr Bragg is near genius in touching home truths. Not typical in instrumentation and arrangement but worth to listen often. Harmony singing on a little Caribbean rhythm he give us another song of love gone by. So that’s it JC. I suppose there will be comments missing some songs. But if we limit this compilation I had to decide which one it will be. I’ve been toying with the idea of a BB compilation for some time and indeed have had four prototype versions that in the end I felt didn’t quite work. But, inspired by Walter, I’ve had another go with the proviso that none of his ten excellent choices appear in mine. It’s coming your way tomorrow. I suppose it was only a matter of time before The Great Bard appeared here. So so glad Tank Park Salute made the list. It really is Bill’s most touching song. Appropriate too that we get a Billy Bragg double-bill (pun not intended, btw) in the week Labour gets a Socialist leader once again. Likewise re Tank Park Salute – gets me every time at the “i offer up to you this tribute” bit , Also good to see Walk Away and that killer role. Waiting for the Great Leap Forward would have to be on mine. Oh boy, I won’t even start contemplating on this one, impossible! Good job, Walter! Also looking forward to the JC version but as long as ‘New Brunette’ appears somewhere in the 20 I’m satisfied. Great job, Walter! Thanks to all your comments – I am also looking forward to JC version.